After a long day at work or with the kids, everyone deserves a bit of relaxation. The spa is a wonderful choice to rejuvenate your mind and body, but wouldn’t you prefer to save money and stay at home? Turn your Atlanta bathroom into a place of luxury with a few simple renovations, tailoring your retreat to create your own perfect getaway. 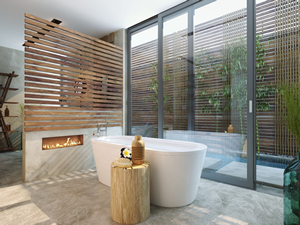 Creating a spa-like bathroom doesn’t have to involve a complete overhaul – nor do you need an enormous bathroom to pull it off. 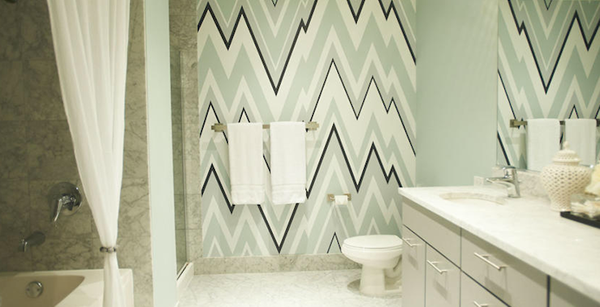 With five easy upgrades, transform any bathroom from functional to fashion-forward. The best spas use natural wood on the walls, on the floors, or as accent pieces. Wood evokes comfort and reminders of nature, blurring the lines between your home and the earth. Installing one wall full of wooden slats, or upgrading your sink into an above-counter wooden bowl, can soften the atmosphere of your bathroom and make you feel more at peace. Consider replacing outdated shelving or cabinets with wooden ones for a cozy upgrade. Replacing your shower curtain with elegant glass doors can make you feel like you’ve entered a spa. Panels of sheer glass add style and refinement to your bathroom and create a more open, airy space. 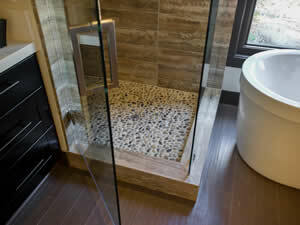 Glass shower doors modernize your bathroom and transform it into a retreat. If you want to perform a total shower upgrade, replace the tiling with a more modern option. Choose tiles such as pebbled flooring – which will feel great underfoot – or white subway tiles on the floors and walls to create a feeling of openness. If you’re updating on a tight budget, paint is your friend. Update your paint scheme to one of natural colors using soft earth tones like green, brown, gray, and beige. Paint an accent wall in a different color as a focal point, or keep colors mellow to soothe the senses. Painting your entire bathroom a soft white is another option, which will create a spa-like atmosphere and make the room seem larger. 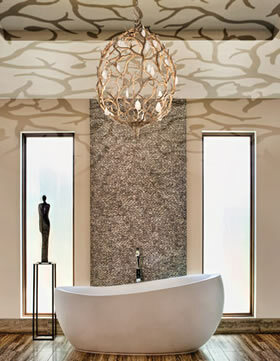 Bathrooms today don’t try to hide light fixtures – they make them a focal point. With the variety of options homeowners have for light fixtures, you can take your pick, from wall sconces with lights that dim or hanging chandeliers to add a bit of luxury. Consider keeping your current fixtures, but making the lights dimmable to add a more relaxed atmosphere to the room. Place candles around the room for truly spa-like lighting and pleasant aromas. Your Atlanta bathroom should be a sanctuary within your home. If you want to go the extra mile to turn your bathroom into a mini-spa, work with experienced Atlanta general contractors who can make your vision come to life. Bathroom remodels can make virtually any bathroom look and feel like you’ve entered a luxury spa. Between heated floors, Jacuzzi tubs, sunken baths, and more, you can add a variety of upgrades according to your specifications.